"A baked zucchini fry with crushed almonds replacing bread crumbs makes a very light, tasty dish. Zucchini are prepped first to get rid of extra liquid so they do not become soggy in the oven. Like having fried food without the oil." Cut zucchini into 3-inch lengths, then cut each piece into 9 fries. 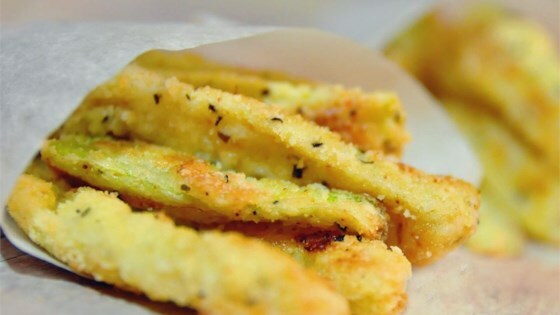 Place zucchini fries into a colander and sprinkle with salt. Let the zucchini pieces drain for at least 1 hour to remove excess liquid. Beat eggs in a shallow bowl. Mix almonds, Parmesan cheese, and Italian seasoning in a second shallow bowl. Rinse salt off zucchini and pat dry with paper towels. Dip each zucchini piece into beaten egg and roll in the almond coating. Place coated fries on prepared baking sheet. Bake in the preheated oven until the zucchini are tender and the coating is crisp and browned, about 25 minutes, turning them halfway through cooking time. The nutrition data for this recipe includes the full amount of the breading ingredients and salt. The actual amount of the breading and salt consumed will vary. I made these for dinners with pizza, and loved them. I'm a big fan of zuchinni, and this was delicious!!! We are low carbing to shred a few lbs. and these were great. I had Almond meal on hand so used it instead of crushed almonds. Will make this again! I left some pieces when chopping the almonds, and glad that I did, as it added a little more crunch to the fries. I added a little Old Bay and some garlic powder as well.